THE BOOK: Blue or Blue Skies. THE PUBLISHER: Big Table Publishing. SUMMARY: Life is a gas for a group of bohemians living in 1970’s Boston. But when dreams collide with reality and a love triangle shatters three hearts, betrayal, fame and buried memories threaten to destroy the friendship they all thought would last forever. THE BACK STORY: I started this book in 1994, and rewrote it over and over and over. Every few years, I would drag it out and redo it, and even though I would like it a lot more, it still didn’t match the vision I had for it. I really wanted to show the dynamics of friendships that refuse to be romances, and the danger of being honest about it. There was such a sadness to some of the characters, and I was such a happy person, that I just couldn’t seem to get my own emotions to go there. But when both my parents died in 2013, I wrote out of a grief so deep that I finally knew I had written the book I’d been dreaming of for 20 years. I love all my novels, but this is the one I’m most proud of. WHY THIS TITLE? : You can imagine how many titles I tried out over two decades! The first one, which every single person I told HATED, was Camus Never Worked in a Shoe Store. For a long, long time the title was Whole Lives (my mom called it that for the rest of her life!) but the final title, which I fell in love with as soon as I came up with it, comes from the lyrics of a song by one of the main characters, about the highs and lows of life. WHY WOULD SOMEONE WANT TO READ IT? 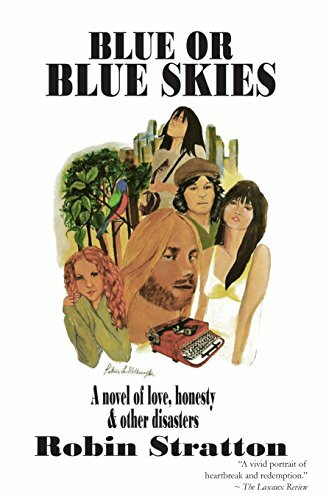 Blue or Blue Skies takes place in the 1970s – when we watched Carson on The Tonight Show, and didn’t have cell phones, cable TV, or the internet. In a way, it was a simpler time.. but it’s the classic story of the man who has everything except the one thing he can’t live without. The main theme is friendship, and how we need to be there for each other, especially after a tragedy.. all set against a backdrop of rock ‘n’ roll, free love, and Bohemia. “The characters in this fast-paced and engaging novel fascinate as we watch them struggle to succeed in life, career, and love. Demons are faced, hearts are crushed, and Stratton explores through her captivating characters–in ways that often hit close to home–what we do when we get what we need, not what we want. This alluring tale will keep you flipping pages through the myriad of twists and turns until the wee hours.” — Bonnie ZoBell, What Happened Here. “Robin Stratton has once again demonstrated her ability to produce rock-solid writing in her new novel Blue or Blue Skies, a classy and intelligent story that will keep the reader glued to the chair and to Stratton’s immaculate text. This is a glorious book!” — Susan Tepper, The Merrill Diaries and From the Umberplatzen. “In this absolutely un-put downable book, five friends struggle to survive love and success.” — Michael C. Keith, The Collector of Tears. “Reading Blue or Blue Skies is like curling up with an intimate friend. The fluid writing and emotional insights draw the reader in and suspend the passage of time. A vivid portrait of heartbreak and redemption; nobody depicts relationship dynamics like Robin Stratton.” — Lascau x Review. SAMPLE CHAPTER: Chapter one of this novel and all my others can be read at my website, http://www.robinstratton.com . I would also love to have people check out the trailer on Youtube: https://www.youtube.com/watch?v=aszOMLqiN_M&feature=youtu.be. WHERE ELSE TO BUY IT: Amazon, Kindle, or a signed copy direct from me!